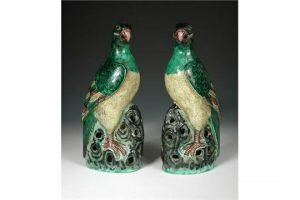 A pair of 19th century famille verte parrots, each of the green birds with yellow breast and aubergine wing feathers, they form mirror images as they perch upon pierced rocks. 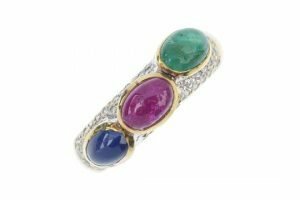 A diamond and gem-set dress ring, the oval emerald, ruby and sapphire cabochon collet curved line, to the pave-set diamond sides and tapered band. 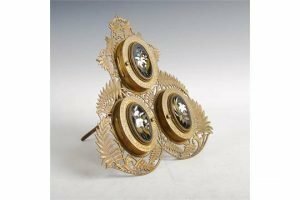 Estimated total diamond weight 0.10ct. 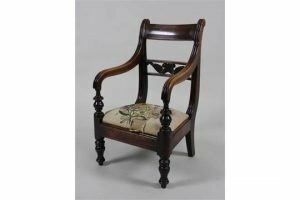 A 19th century mahogany child’s bar back open armchair, on short baluster turned front legs. 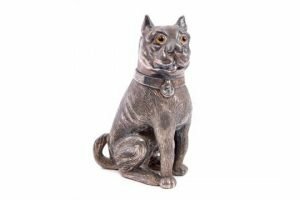 A 19th century novelty white metal salt, modelled in the form of a seated Bullmastiff dog, with screw-in head with glass eyes. 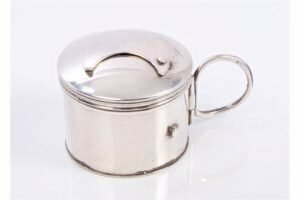 A mid-18th century silver bougie box of small proportions, with cylindrical body, hinged handle and domed cover with moon-shaped hinged extinguisher. 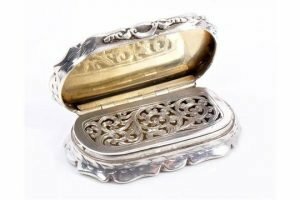 A Victorian silver vinaigrette of shaped oval form, with engine-turned decoration and foliate engraved borders, hinged cover with vacant cartouche, opening to reveal a silver gilt interior with hinged pierced foliate grille. 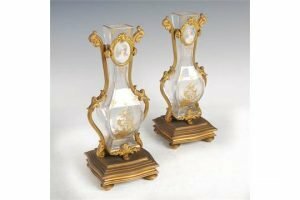 A pair of late 19th century French gilt metal mounted glass bud vases, of square baluster form with gilded details enclosed within foliate cast mounts set with oval painted portrait miniatures depicting 19th century Ladies, on shaped square plinth bases with four bun feet. 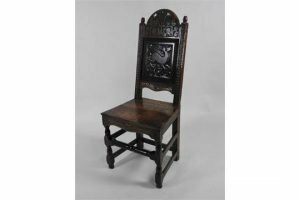 An 18th century and later oak back stool with arched top rail over a later back panel, above a boarded seat on block and baluster front legs united by a replacement stretcher. 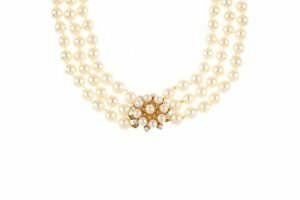 A 9ct gold cultured pearl three-row choker necklace, comprising three rows of forty-two, forty and forty cultured pearls. 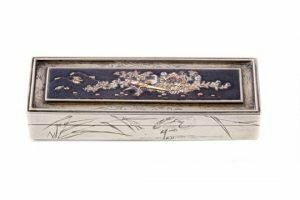 A Japanese white metal box of rectangular form, with engraved stork, spider and reed decoration, hinged cover with engraved border and central bronze panel with three-colour metal inlay of pheasants amongst flowers and foliage, back panel signed to left hand side above and below hinge. 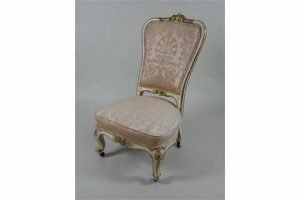 A 19th century Louis XV style cream painted and giltwood nursing chair, with padded back and over stuffed seat on short cabriole front legs. 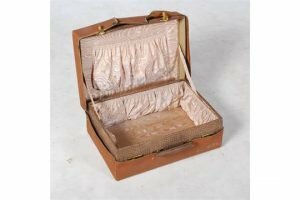 An early 20th century simulated crocodile skin leather suitcase, with lacquered brass mounts and original canvas sleeve. 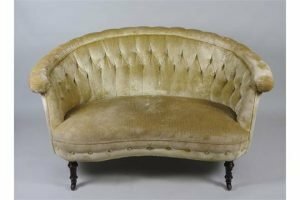 A Victorian upholstered curved linear two seater sofa, on ring turned tapering short front legs terminating brown salt glazed castors. 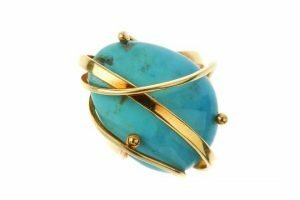 A turquoise dress ring, the pear-shape turquoise cabochon within a bead terminal and scrolling tendril surround, to the bifurcated sides. 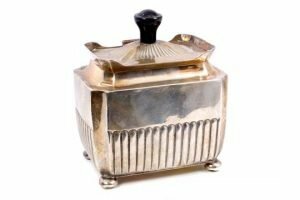 A Victorian silver tea caddy of rectangular form, with concave corners and half fluted decoration, hinged domed and fluted cover with spurious finial on four bun feet. 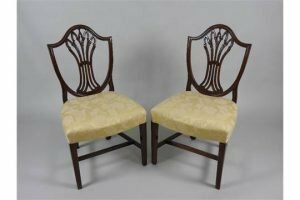 A pair of late 19th/early 20th century mahogany Hepplewhite style shield back dinning chairs, with vase shaped pierce backed splat above an over stuffed seat, on square tapering front legs united by a plain H structure. 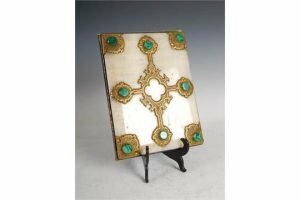 A Victorian brass and malachite mounted marble and leather desk blotter, with green satin and paper lined interior. 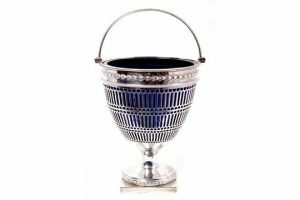 A George III sugar basket of neoclassical form, with pierced decoration, engraved armorial shield and bead borders, blue glass liner, bead swing handle, on pedestal foot with square base. 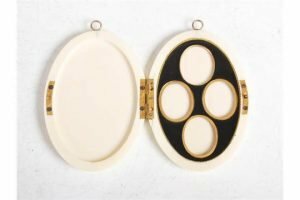 A late 19th century ivory, gilt metal and black enamel oval portrait miniature case, the hinged cover opening to a fitted interior with four smaller oval apertures.